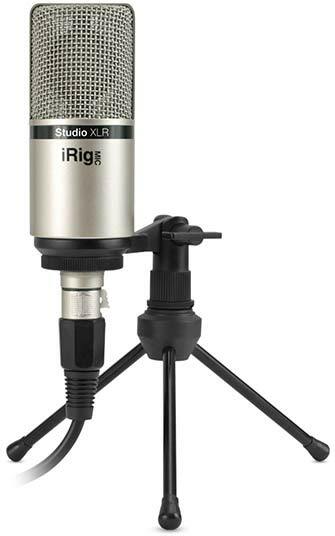 Developed for professional studio-quality recordings, the iRig Mic Studio XLR features a high quality unidirectional 1" condenser-electret microphone capsule. The iRig Mic Studio XLR is a pro-quality condenser microphone that requires 48v phantom power which may be provided by a mixer, external microphone preamplifier or interfaces like iRig Pro Duo, iRig Pro or iRig Pre. Output from the microphone's XLRM-type connector is Low impedance balanced. Despite its professional features and sound, iRig Mic Studio XLR is extremely compact and affordable, with just 45 mm diameter and about the length of an iPhone. iRig Mic Studio XLR fits easily into your laptop or gig bag for on-the-go recording anywhere inspiration strikes. Simply plug iRig Mic Studio XLR into your mobile interface’s XLR input, turn on the phantom power, adjust the gain settings for your application and hit record. Use iRig Mic Studio XLR to record ideas quickly and easily — mic your guitar amp in a snap, capture that acoustic performance with ease or over-dub a stunning vocal into your mix on the go. You can use it to record a single performance, or an entire band. And with its unidirectional pattern design, you can easily capture your audio source with no background noise interference. When used with an iRig Pro Duo, you’ll have the perfect idea-capturing system for the traveling singer-songwriter group writing sessions — plug iRig Mic Studio XLR into one channel for vocals and use the other channel for your acoustic input. AmpliTube and VocaLive for iOS both support multi-channel recording giving you the perfect “plug-and-play” solution for recording mobile sessions. Now you have the XLR flexibility to grab stunning audio on the go with iRig Mic Studio XLR. 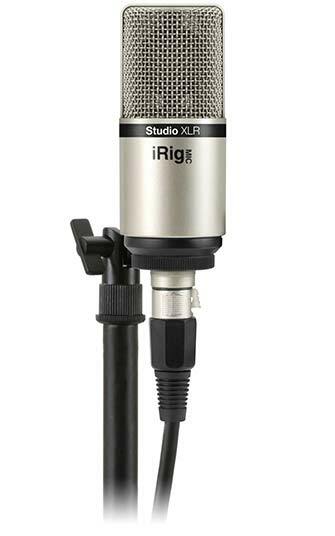 iRig® Mic Studio XLR is a registered trademarks property of IK Multimedia Production Srl. All other product names and images, trademarks and artists names are the property of their respective owners, which are in no way associated or affiliated with IK Multimedia. Product names are used solely for the purpose of identifying the specific products that were studied during IK Multimedia’s sound model development and for describing certain types of tones produced with IK Multimedia’s digital modeling technology. Use of these names does not imply any cooperation or endorsement. iPhone, iPod touch, iPad, Mac and GarageBand are trademarks of Apple Computer, Inc., registered in the U.S. and other countries. App Store is a service mark of Apple Inc. Android™ is a trademark of Google Inc.